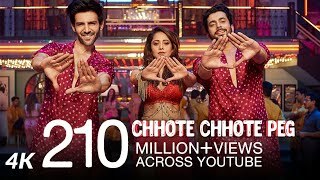 Chote Chote Peg AKA Chhote Chhote Peg Lyrics: Yo Yo Honey Singh is back with his second track from Luv Ranjan’s film Sonu ke Titu ki Sweety starring Kartik Aaryan. The song “Chote Chote Peg” is sung by Neha Kakar and Navraj Hans and features a rap by the one and one the only – Yo Yo Honey Singh. Tabhi toh convince mein kar raha hoon, kya?